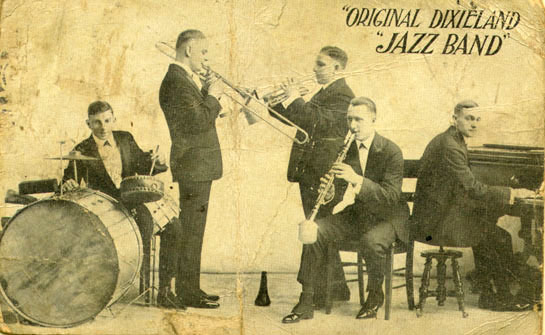 "Until , New Orleans jazz was essentially un­known outside of the city of its birth and Chicago, where the five players who comprised the Original Dixieland Jazz Band had caused a stir the preceding March. It was, however, nothing compared to the one that greeted their opening [in New York] at Reisenweber's 400 Club Room on January 27, 1917. Within hours the word was out that something very new and very hot had come to town, and the quintet's first Victor recordings, cut on February 26 and rushed into print nine days later, introduced a generation of listeners -- and musicians -- to the raucous music that would give a name to the coming decade. Other jazzlike music had previ­ously been recorded, but 'Livery Stable Blues' and 'Dixie Jass Band One-Step' were among the first 78 sides to be cut by jazz musicians from New Orleans, as well as the first whose label described them as jazz (or, rather, 'jass'). Newspaper ads in New Orleans called the combined results 'positively the greatest dance record ever issued,' and purchasers throughout the country agreed: Victor 18255 is believed to have been one of the earliest popular rec­ords to sell a million copies. Its success put an end to what was left of the ragtime craze, for other bands rushed to record in a similar style, and their music became the gold standard in dance halls across America. The Jazz Age had arrived."